Mr. Grey Wanted by FBI who have stolen 1.2 billion of username and password credentials but still another information regarding 1.2 billion stolen credentials by CyberVor hacking team and mr. grey we are presuming as a single hacker.. having much more twist in the story! 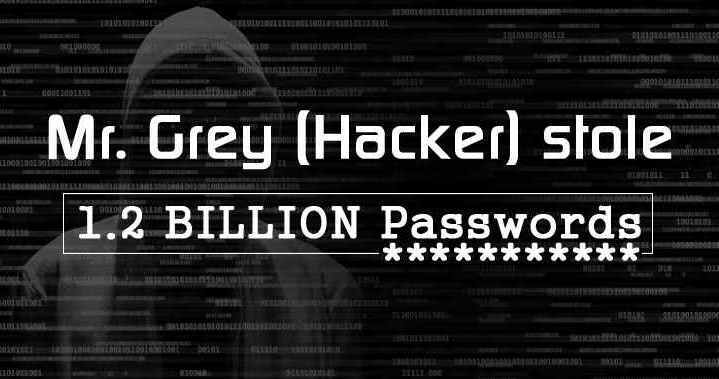 Single Hacker mr.grey had offered in Russian forum having of large numbers of Facebook, Twitter and Russian Social Networking VK users log-in credentials. FBI after finding mr.grey’s email address from spam-sending tool the investigator also found post in Russian Hacking Forum in which mr. grey offering forum members regarding having of 1.2 billion of log-in credentials of Facebook and Twitter users if they need any information of any users. A CyberSecurity Firm Hold Security in August 2014 have revealed a document, mr.grey was verified having several cyber criminal charges in Russia who is responsible for the stealing information from more than 420,000 websites. It is cited that mr. grey have reportedly using botnet which a function of SQL injection vulnerability and the same method is being used in Talk Talk hack. The federal court in Milwaukee, Wisconsin have asked FBI about the possible cost of having such big credentials. The federal court has also agreed upon supporting FBI in investing the year of 2014 FBI have released warrant against mr.grey, the search warrant executed after the information found having an email in the spam-sending tool. After FBI involvement in finding out the hacker mr.grey and its network but it will halt by another cybersecurity firm, Hold Security claimed to have information of Russian hackers moniker ‘CyberVor’ who may have stolen 1.2 billion credentials as username and passwords and more than 500 million users of email addresses. FBI found an email in the spam tool contain ‘mistergrey’, after investing furthermore they found that this email has been registered in 2010. There is a wider choice in the mystery of mistergrey or Mr. grey. In 2011, FBI found mr. grey in search of Russian Hacking Forum, mr. grey posted that if anyone wanted any account information of any users from Facebook, twitter and Russian VK social network then he can share that. Hold Security Chief Information security officer said mr. grey likely be operating the system which have stolen billion username and passwords of users from Facebook and Twitter, mr. grey might be using some sort of technology or tool that have led him to do more easiest way in getting more than 1.2 billion credentials. With the statement from Hold Security officer, Facebook and Twitter refused to comment, FBI and U.S. federal department also refused to apply any immediate comment. Hold Security also said that somehow mr. grey connected with CyberVor, the email found in spam-sending tool and later on offering usernames and passwords to the members of Russian Hacking Forum, basically CyberVor interested in credentials only, they have not any further interested in selling those credentials for long time, hackers stolen users personal cache data which have scored over 1.2 billion credentials as emails and passwords. The FBI and the Hold Security have two different culprits but having the same materials as 1.2 billion of stolen credentials, that makes unclear whether mr. grey himself being alone have tone this massive stolen workshop, hypothetically if we think about the strategy of getting such a numbers of credentials then it might not be a single man.. but still unclear about the real fact. Stay with us will be updating out the fact soon.